Who does what — and with what agenda — in the Russian media? 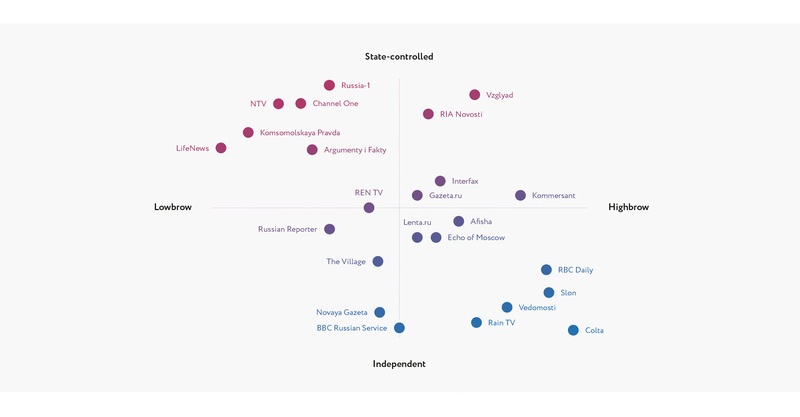 Take a look at our (subjective) guide to Russia’s media landscape. Move your cursor over the dots for more information. Launched in April 1999 by entrepreneur and designer Ilya Oskolkov-Tsentsiper, biweekly Afisha magazine has built its reputation on setting the cultural and entertainment news agenda. Filled with interviews and reviews, the magazine’s USP is its presentation of Moscow as a city to rival London or Berlin, making it particularly influential among young urbanites. The magazine and website are owned by Afisha.Rambler.SUP, one of Russia’s largest media groups. Although its circulation figures have dropped from 33 million in 1990 to 2.2 million today, Argumenty i Fakty remains one of the most read newspapers among Russia’s older, educated middle classes. Its continued popularity among an influential sector of society, meant that in March 2013, the Moscow City Government acquired the weekly from billionaire brothers Alexei and Dmitry Ananyev’s investment group PromSvyazCapital, adding to the city’s ever-growing portfolio. In 2011, the BBC Russian Service switched off its radio frequencies for good after 65 years on the airwaves. Since then it has continued to publish and broadcast global news online. Despite the odd allegation about lack of independence (in 2007, The Economist claimed the BBC toned down reports on the assassination of Alexander Litvinenko to continue use of local transmitters), it is still the news source of choice, especially at times when confidence in Russian media wanes; during the Ukraine crisis, the number of visitors to the site doubled. Russia’s most popular television channel, Channel One (Pervy Kanal), was the first to broadcast after the disintegration of the Soviet Union. From 1994 to 2001, oligarch Boris Berezovsky owned a controlling stake in the channel (then called ORT), which he claims he was forced to sell under pressure from Putin. The stake was acquired by Chelsea FC owner Roman Abramovich who sold it on to the state shortly afterwards. In the years that have followed, Channel One has been criticised for its highly opinionated, partisan coverage of government affairs. Behind the scenes, the channel’s director general, Konstantin Ernst, is a Putin ally while Alexei Gromov, the president’s chief of staff, sits on the board of directors. Originally a purely arts and culture website, Colta’s shift to more political news has made it a key source of information for the self-proclaimed Russian intelligentsia. The website was set up by editor-in-chief Maria Stepanova and her editorial team after they were fired from the now-defunct OpenSpace. The website is financed by a mix of crowdfunding and private patronage, a business model which, although it ensures editorial independence, has already shown its flaws: in 2012, it closed down due to a lack of funds, having to be rescued by high-profile figures such as Irina Prokhorova, chief editor of the New Literary Observer. Despite being two-thirds owned by Gazprom-Media, Echo of Moscow (Ekho Moskvy), founded in 1990, continues to be Russia’s most authoritative and liberal all-talk and news radio network. Headed by the respected editor-in-chief Alexei Venediktov, Echo of Moscow is also known for its news website, which publishes articles by numerous high-profile opposition figures such as anti-corruption blogger and lawyer Alexei Navalny. Since its launch in 1999, politics and business website Gazeta.ru has steadily grown to become one of the most reliable online news sources in Russia. Formerly owned by Yukos, the oil giant headed by opposition figure Mikhail Khodorkovsky, it was eventually acquired by SUP Media (now Afisha.Rambler.SUP) after the oligarch was jailed for alleged tax evasion. With hard-hitting news investigations and analysis provided by heavyweights such as Fyodor Lukyanov, Gazeta.ru is a go-to website for serious news junkies. Russia’s only non-state-owned news agency, Interfax, provides real-time business news and intelligence on a range of subjects from metals and mining to oil and gas. Although its founder, Mikhail Komissar, was briefly in Boris Yeltsin’s presidential administration from 1997 to 1998, the editorial line at Interfax has always maintained a critical distance from the Kremlin. The wire service, launched in 1989, has offices around the world as well as a number of subsidiaries covering China, Kazakhstan, Ukraine and Europe. Founded as the organ of “truth” by the Komsomol, the youth wing of the Communist Party, in 1925, this daily newspaper surged in popularity during perestroika thanks to its social criticism. In 1990, it had the highest print run for a daily in the world, hitting 22 million copies. Its continued success is largely attributable to a steady downmarket shift towards populist sensationalism begun in the 1990s and continuing today. Now under the control of oil and engineering magnate Grigory Beryozkin the tabloid shies away from any criticism of the regime. Lenta.ru has a longstanding reputation as a source for independent news in Russia, reporting on both domestic and foreign affairs as well as culture and the economy. Although a part of Afisha.Rambler.SUP, owned by Kremlin-friendly oligarch Alexander Mamut, its independence has only recently come under threat. In an unexpected move this March, Mamut replaced Lenta.ru’s editor-in-chief, Galina Timchenko, with pro-Kremlin journalist Alexei Goreslavsky, bringing the future independence of the website into question. A popular 24-hour rolling news channel, LifeNews was launched in 2009 by media father-and-son team Aram and Ashot Gabrelyanov, dubbed the Russian Murdochs. The channel’s unwavering loyalty to the Kremlin guarantees it access to high-level government information: it was LifeNews, for example, that first published pictures of Edward Snowden hiding in Moscow’s Sheremetyevo airport. The last major print newspaper that can be described as truly independent, Novaya Gazeta is unforgiving in its criticism of the Kremlin. The paper, which has high-profile support from the likes of Mikhail Gorbachev, is 51%-owned by its staff, with a controlling stake in the hands of Alexander Lebedev, owner of the Independent and Evening Standard titles in the UK. Four Novaya Gazeta journalists have been murdered in recent years, most notably prominent Kremlin critic Anna Politkovskaya who was kiled in 2006. One of the first major independent television channels to appear after the collapse of the Soviet Union, the takeover of NTV in 2001 by state-owned Gazprom Media has come to symbolise the sharp decline of free media in Putin’s Russia. With its staple of crime dramas and reality TV shows, the channel is hugely popular in the country. Once praised for its hard-hitting reports and neutral coverage of Russian politics, the channel turned into a propaganda weapon almost overnight during the 2011 and 2012 anti-government protests. These days, NTV’s speciality is conducting smear campaigns against opposition leaders and journalists considered disloyal to the Kremlin. It may only be four years old but Rain TV has rapidly established itself as the lone oppositional voice in a sea of Kremlin-controlled TV media. Station of choice for Russia’s urban middle class, the channel faces an uncertain future after it was dropped by cable operators earlier this year following a controversial viewer poll about the Siege of Leningrad. The channel is run by husband-and-wife team Natalia Sindeeva and Alexander Vinokurov who also own business website Slon.ru and upmarket Moscow freesheet Bolshoi Gorod. Established in 2003, business-focused RBC Daily attracts a serious crowd looking for their daily hit of financial news, analysis and editorial commentary. The website is part of the RBC Group, which also owns a monthly business magazine and television channel. The media holding belongs to billionaire Mikhail Prokhorov’s investment fund, Onexim Group, which in 2013, appointed Dutch journalist Derk Sauer, one of Russia’s most influential media managers, chief executive officer of RBC. Considered one of the last bastions of free media in Russia, REN TV is one of the few television channels to broadcast views critical of the state. The channel was launched in 1997 by media entrepreneur Irina Lesnevskaya and her son Dmitry, and went on to become home to some of the best journalistic talent in the country. After a government crackdown on independent media in 2008, a controlling stake in the channel was snapped up by Putin ally Yuri Kovalchuk’s National Media Group. Recent years have seen a change in programming in favour of pseudo-scientific documentaries. Despite this, the channel still carries some weight: after he was released from jail, Mikhail Khodorkovsky announced that REN TV news anchor Marianna Maximovskaya’s show was the only news source he trusted while locked up. President Vladimir Putin sent shockwaves through the Russian media when he announced the closure of respected state-owned news agency RIA Novosti in December 2013. In its place is a new organisation Rossiya Segodnya (Russia Today), which brings together RIA Novosti and radio station Voice of Russia under the leadership of pro-Kremlin ultra-conservative television host Dmitry Kiselyov. Once all the old structures have been successfully integrated, the organisation will cover “state policy and public life in the Russian Federation”. Russia-1 is the second most watched channel in the country, keeping its older, more conservative audience happy with slushy dramas, films and increasingly xenophobic and vitriolic news broadcasts from the channel’s figurehead, Dmitry Kiselyov — part of a notable anti-liberal trend starting after the 2011 and 2012 protests. Russia-1 is the flagship channel on the government-owned Rossiya network, which also includes a culture channel and 24-hour news. A mainstream current affairs magazine, Russian Reporter’s easy-to-digest coverage of popular topics in news, culture, science and photography appeals to a broad demographic. In 2010, the magazine was the surprising choice of partner for Wikileaks and the only media outlet in Russia to receive leaked documents from the whistleblowing organisation. Russian Reporter is part of Expert Group, a media holding, which is part-owned by aluminium tycoon Oleg Deripaska. Business and finance focussed Slon has quietly risen since it launched in 2009 to be a reliable source of online news for Russia’s liberal classes. Funded by the media couple Alexander Vinokurov and Natalia Sindeeva, Slon is just one media title in their portfolio which also include Rain TV and Bolshoi Gorod. The website was a victim of a DDoS attack during the 2011 parliamentary election when it published allegations of electoral fraud. Launched in 1999, this daily online and print newspaper, is a joint venture between Dow Jones, the Financial Times and Finnish media group Sanoma. Such respected patronage has not only ensured Vedomosti’s place among Russia’s business and financial elite but has also endowed the editorial team with the necessary backing to remain independent. Vedomosti also boasts strong regional circulation with local editions published in St Petersburg, Nizhny Novgorod, Samara, Rostov-on-Don, Yekaterinburg and Kazan. Launched in Moscow in 2010 by media entrepreneurs Sergey Poydo, Alexei Amyotov and Vasily Esmanov, The Village immediately became a major hyperlocal voice for young urbanites. Part user-generated forum, part blog, part guide, the website not only covers local cultural news but also also runs urban initiatives like bike parking and recycling. Now expanded to Kiev and St Petersburg, and with more than a million visitors a month, The Village is the jewel in the crown of hipster media empire Look At Media, which runs four other websites covering fashion, culture, technology, urbanism and entrepreneurship. Launched in 2005 by internet expert and politician Konstantin Rykov, online newspaper Vzglyad has never hidden its close ties to the Kremlin. The website is widely considered a mouthpiece for the Russian political establishment and makes no attempt at neutral language, regularly peppering its articles with phrases such as “liberal traitors” and “Orthodox renaissance”. The website has also served as a breeding ground for a new generation of Kremlin-friendly journalists including Alexei Goreslavsky, the new editor-in-chief of Lenta.ru.